Unlike many of the designers who showed their F/W 18 collections over the last few weeks of fashion month, Demna Gvasalia wants you to actually be warm next winter—very warm. The proof is in the buzzy Balenciaga runway show, which featured both men’s and women’s looks, all of which were equally covetable and inspiring. Aside from the puffers and layering, however, there were several other notable moments that deserve a callout. Between the trends that we’re glad are sticking around next fall and the new ones we’re undeniably intrigued by, simply keep reading for our breakdown of the six biggest must-know moments from the show. It's no surprise that a designer who, through both Vetements and Balenciaga, has championed the practical puffer as a fashion item is continuing to endorse it for next fall and winter. Are these going to become a thing? If so, we sure hope they have cell-phone touch technology. Both on their own and styled as part of a belt, the keychain was a surprisingly big part of the accessory selection in yesterday's show, and we're into it. We were happy to see dad sneakers, styled on male models, runway because it means we'll get to keep wearing them for a while. And, shown as both purses and in their traditional form, the fanny pack (or belt bag) was present throughout the collection, signifying that the trend is here to stay too. It’s also worth noting that the house is continuing the trend of fashion for a cause, with sales from it’s World Food Program-branded products benefiting the charity’s fight against hunger. The Aww Moment: Puppies and Kittens! When it came to handbags, it seems there was one mantra: Put an adorable animal on it. Not going to lie, whatever they were going for definitely worked. Now for some practicality, the biggest styling takeaway from the show, for me at least, was the expert layering. 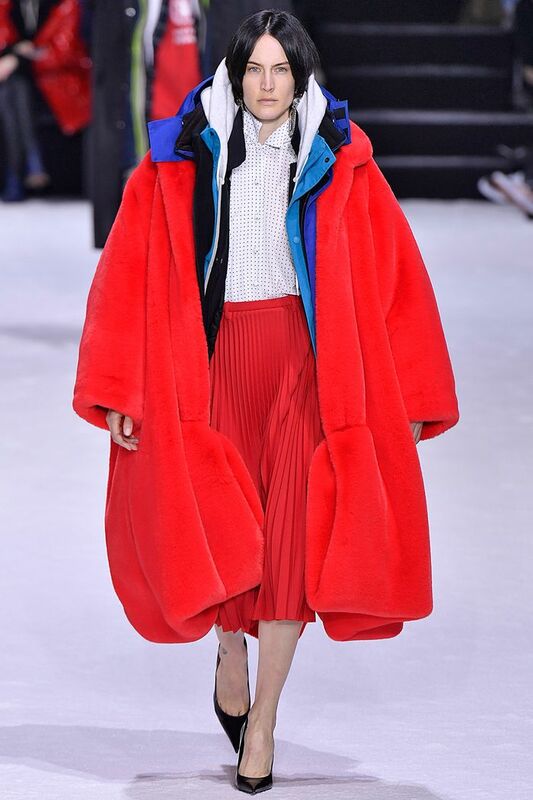 From layers hoodies to parkas to furs, the show has me considering going one size up in my next outerwear purchase in order to get the look myself.